alaTest har samlet og analysert 630 anmeldelser fra magasiner og websider. Gjennomsnittlig så rangerte brukerne dette produktet 91/100 og eksperter vurdere dette produktet 72/100. A Kindle Fire HD 10 with kid-friendly extras. Amazon Fire HD 10 Kids Edition. The Amazon Fire HD 10 is the big daddy of the new low-cost Fire tablet range. Slates this large have fallen out of favour now that every company out there seems to have made a great 8-inch tablet. Bright, vivid screen; Snappy performance ; More expensive than other Fire slates; No Google apps ; The Fire HD 10 has the best screen of any Amazon tablet, but it's also the most expensive. 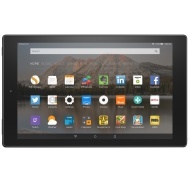 More expensive than other Fire slates; No Google apps ; The Fire HD 10 has the best screen of any Amazon tablet, but it's also the most expensive. A tablet that mixes the good, the bad and the ugly. But focuses too much on the last two. The tablet itself doesn't do much to stand out, but Amazon has made sure this is a safe, fun place for children. It's packed with things to do, is really durable and simple to use.